In many homes, it is already time to take down the Christmas trees and pack up the lights and ornaments for another year. Gone is the mess of wrapping and tissue paper and boxes; order has been restored to the living room. The celebration of Christmas, and the novelty of the gifts received, is over. But, as all parents know, our children have a different view. For them, there can never be too many presents to open, toys to play with, or Christmas lights to see. Children would be perfectly happy to celebrate Christmas every day of the year. To a certain extent, the Church agrees, and, like a loving mother, She gives us an entire season in which to celebrate the Nativity. Early Christians linked the celebration of the Nativity with Theophany as one feast, because both events clearly revealed Christ’s divinity. However, by the year 380, St. Gregory Nazianzus attests to a period of 12 days in which the Church celebrated the Nativity and prepared for Theophany and the blessing of the waters. Yet, even though the feasts are now celebrated almost two weeks apart, they are intimately linked in the mind of the Church. The theme common to both feasts is the revelation of the Holy Trinity, and that the One God of Israel is One God in Three Persons. At His Nativity, the Son and Word of God enters into all creation by being born in a manger. At the Theophany, the Son and Word of God enters into all of creation by entering into its most basic building block – water. 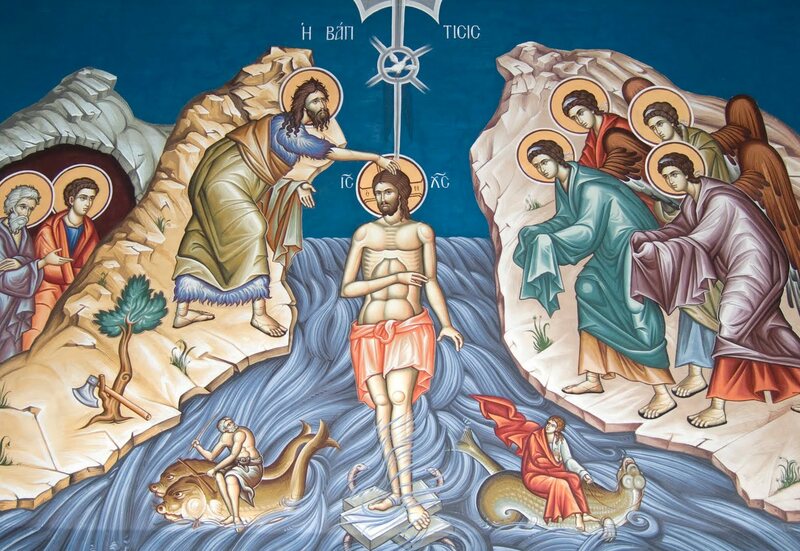 In particular, Theophany manifests the Trinity as the Spirit descends upon Christ in the form of a dove, and the voice of the Father bears witness to the baptism of His Son. For let this mind be in you, which was also in Christ Jesus: Who being in the form of God, thought it not robbery to be equal with God: But emptied himself, taking the form of a servant, being made in the likeness of men (Philippians 2:5–7). The Greek word kenosis (emptiness) describes Christ’s loving act in becoming man: He emptied Himself out in order to become like us; He entered into His creation and became part of it. As a child, He was vulnerable, nay helpless, relying on His parents for sustenance and shelter, even as He continued sustaining all of creation by His power. He is circumcised on the eighth day after His birth in fulfillment of the covenant that He made with Abraham. He ‘grew in wisdom and stature,’ even though He is the source of all Wisdom. And now, as John offers a baptism of repentance in the Jordan, Christ comes to fulfill even this, though He was sinless. John recognizes that he is not worthy to baptize Christ, yet our Lord permits it anyway, so that by our participation in His baptism, we would gain the forgiveness of sins; the regeneration of life; and our entrance into the laos, the people of God. Humility is a nameless grace in the soul, its name known only to those who have learned it by experience. It is unspeakable wealth, a name and gift from God, for it is said: Learn not from an angel, nor from man, nor from a book, but from Me… for I am meek and humble in heart. These are challenging words from a challenging saint. But as we begin a new year and make resolutions about our diet, our exercise routine, our finances, and other cares of this life, let us also resolve to emulate the humility we find in Christ, especially in His Nativity and Theophany. As St Paul says, “He did not count it robbery to be equal with God” – and He did not give up His dignity by becoming one of us. Nor is humility without its rewards for us in this life, as it attracts the mercies and love of God Himself.